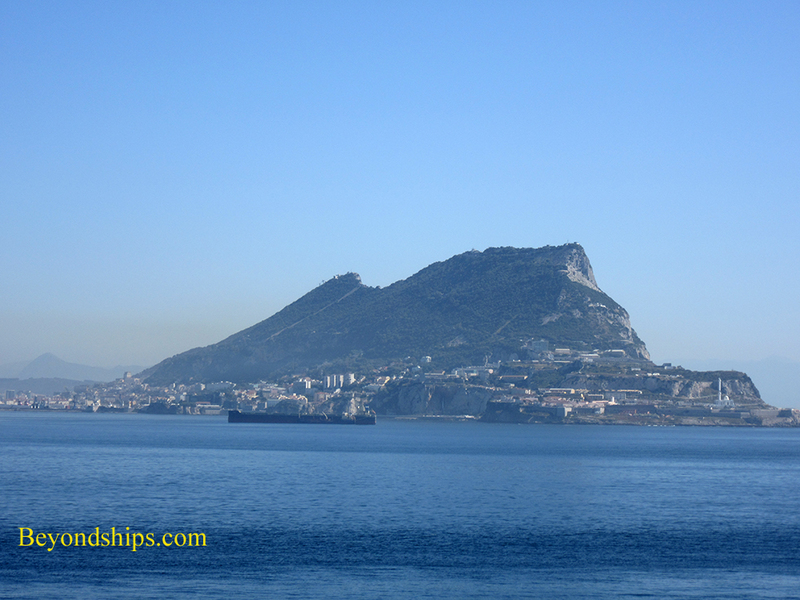 Perhaps more so than any other port, Gibraltar is dominated by one feature - - the Rock of Gibraltar. 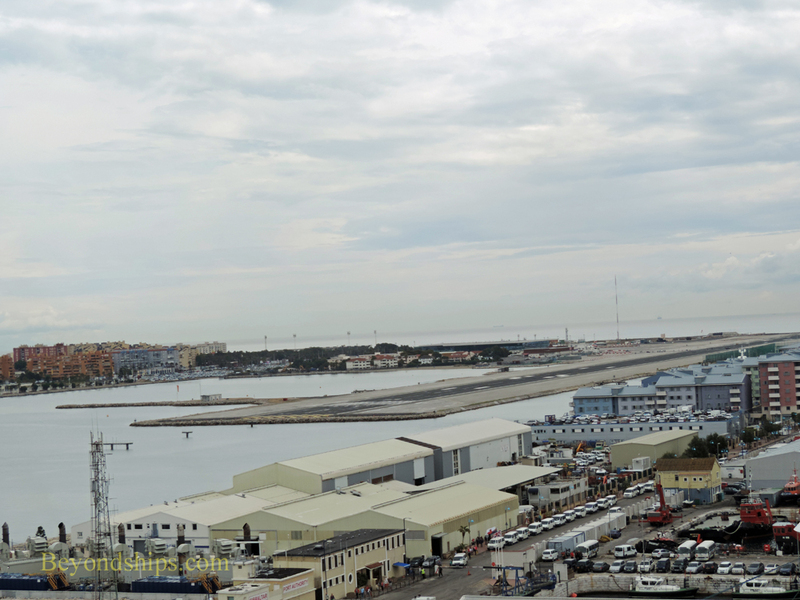 A monolithic promontory made predominately of limestone rises some 1,350 feet (411 meters) above the Bay Of Gibraltar towering over the port. It is a spectacular sight to see as your cruise ship enters the port. The Rock occupies most of the territory of Gibraltar, which is only 2.25 square miles (5.8 sq. km). Located on the southwestern tip of the Iberian Peninsula, Gibraltar is itself a small peninsula jutting into the sea at the point where the Atlantic and the Mediterranean meet. It is only 14 miles across the Straits of Gibraltar to Africa. To the north, Gibraltar is connected to Spain via a narrow neck of land. Essentially crowded into a thin strip of land between the Rock and the Bay, the city of Gibraltar is not very big. One can easily walk from one end to the other. It is a British city. In a referendum held in 2002, the population (28,700) voted overwhelmingly to remain a British territory, which Gibraltar has been since 1704. You would not have needed to take a poll to predict this outcome. The Gibraltarians shop in stores that are branches of the major British chains, there are red telephone boxes and the police constables would not look out of place on the streets of London. 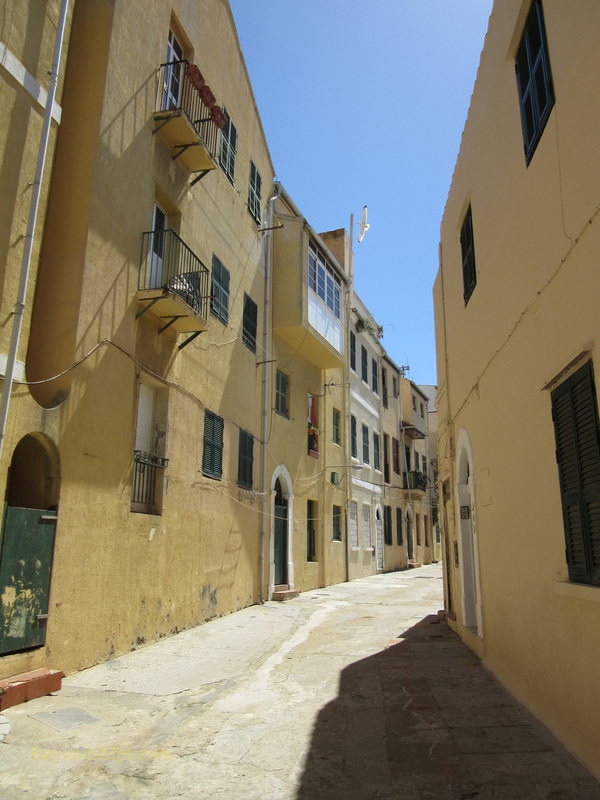 Gibraltar resembles a small British city. Still, you do see the influence of other cultures in Gibraltar. Although the official language is English, many people also speak Spanish. You can also see a Moorish influence in some of the architecture. Although the British monarch is the head of state, Gibraltar is self-governing except in matters of defense and foreign policy. Still, its citizens are considered British citizens. Gibraltar issues its own bank notes and coins, which are legal tender within Gibraltar. 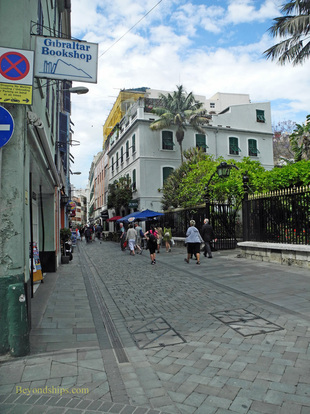 The Gibraltar pound, however, is tied to the official currency - - the British pound sterling. The territory has a most un-British climate. The average July high temperature is 81˚F (27˚C) and the average January low temperature is 50˚F (10˚C). Precipitation is mostly during the winter months and the average yearly precipitation is 30.2 inches (767 mm). 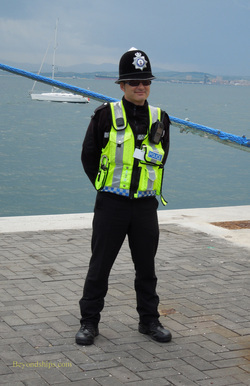 Below left: The police constables' uniforms underscore the Britishness of Gibraltar. 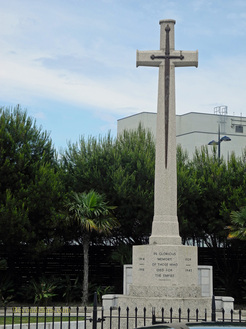 Below right: A war memorial. The Spanish border lies just north of the airport. 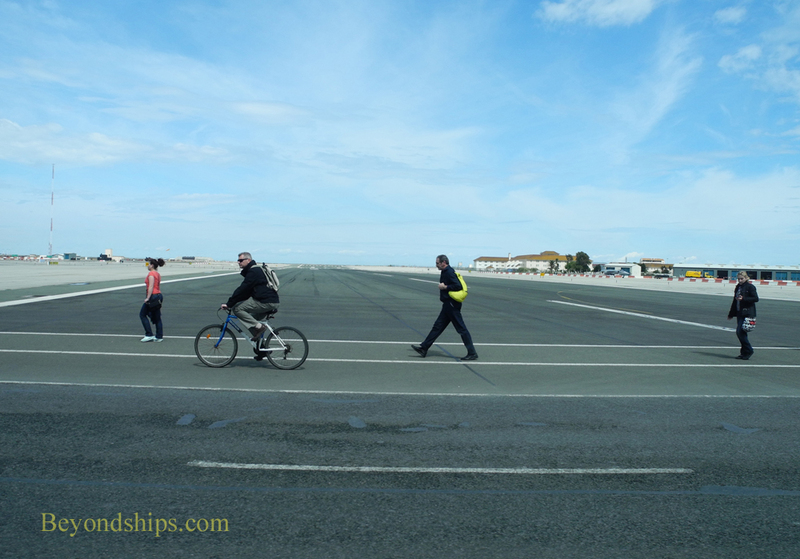 Both pedestrian and vehicle traffic have to cross the runway to get to or from Spain. 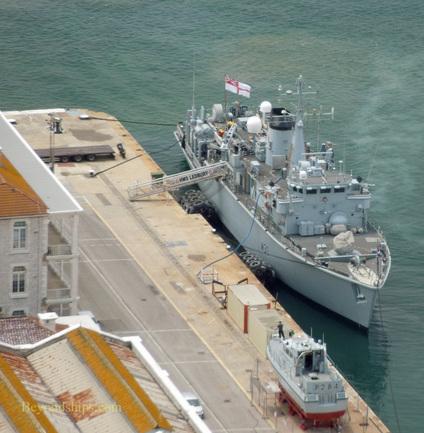 Above: The Royal Navy can still be seen in Gibraltar.